Olive oil and balsamic are all over this plate, yet hidden from plain sight. The grass fed N.Y. steak for instance was marinated with a bright and delicious combination of Chipotle infused olive oil and Pineapple white balsamic vinegar with a little cracked pepper and sea salt. 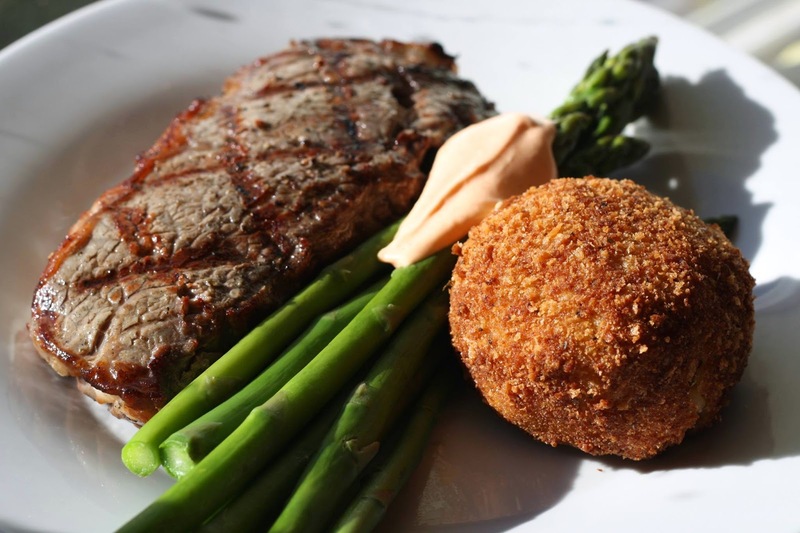 The aioli on the asparagus is made with Harissa infused olive oil, and the truffled butternut squash arancini was deep fried with Extra Virgin Olive Oil while the risotto was made with a splash of White Truffle oil. In a heavy bottom wide skillet or saute pan set over medium heat, saute the onion in the olive oil until translucent. Add the rice and saute until just lightly beginning to toast. Stirring all the while, add the wine and continue to saute and stir until it is absorbed. Add the stock by the half cupful stirring constantly until each a addition has been absorbed. When half of the stock is used, add the butternut squash and stir. Continue adding the remaining stock. Off heat, finish by adding the cheese and truffle oil. Adjust seasoning and serve as is, or if you will be making the arancini above, put into a covered container and refrigerate overnight. Heat the oil in a heavy bottom pan or fryer to 350 F. Grab two tablespoons of risotto and place in the palm of your hand. Make an indentation in the center of the rice and add a small piece of cheese. Form the ball around the cheese, dredge in flour, then in the beaten egg, and then into the bread crumbs. Preheat the oven to 200. Fry the arancini until the breadcrumbs are golden brown. Set onto a rack, and place into the oven to keep warm as you fry the remaining arancini.